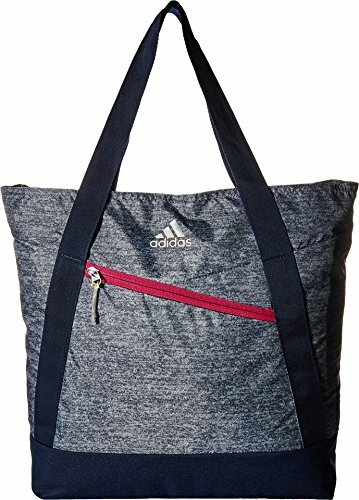 This bag has everything you're looking for in a classic gym bag. 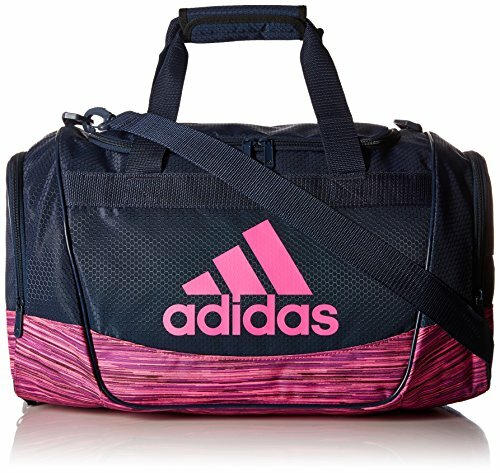 The main zippered compartment is roomy enough to stash your gym clothes or cover you for a long trip. This bag is built to last - with a lifetime warranty and a reinforced material - the value can not be beat. Lifetime warranty - built to last. Extra roomy main compartment that stands tall for easy packing. 2 zippered end pockets - to keep gear organized. Reinforced 3D ripstop material - built to stand up to wear and tear. Zippered interior pocket to stash the little stuff. Padded shoulder strap that is also removable. Comfortable haul handles for easy carry. Space for your team's branding on the end pocket. Imported. 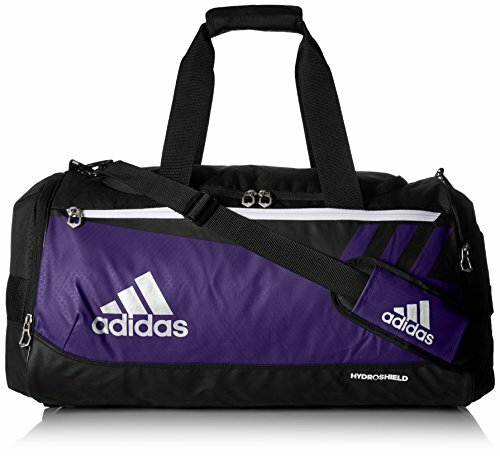 For a workout or an away game, there is no better bag with a Lifetime warranty out there. The team Issue Duffel is built for superior team functionality. The large main compartment features an interior zippered pocket for your valuables. On one end cap of the Duffel is a fresh PAK ventilated compartment, great for keeping smelly shoes and gear separate from the rest of your stuff. On the other side of the bag is a mesh drop pocket for additional storage. The large, easy-access front pocket with key fob is perfect for quickly stowing items. The water resistant hydro shield material will protect your stuff from a wet field or gym floor. The dual adjustable, removable shoulder strap, padded air mesh shoulder pad, and soft -tricot wrapped haul handles let you carry your gear comfortably. The additional side haul handle allows for storage of the Duffel in a locker and quick access to your bag in an overhead compartment. The screen-printed Adidas brand mark and screen-printed graphic complete the team look. The blank space on the opposite side of the bag and on top leave plenty of space for team branding. Haul handle is extra long to make carrying your yoga mat a breeze. Exterior zippered pocket to keep your shoes and dirty gear separate. Great interior organization to keep things in their place. Stand tall - easy open shape to make packing for class quicker than ever. Padded tablet pocket. Built to last, this durable bag has room for all your daily gear, with one main compartment and two extra zip pockets on the side. Lifetime warranty. 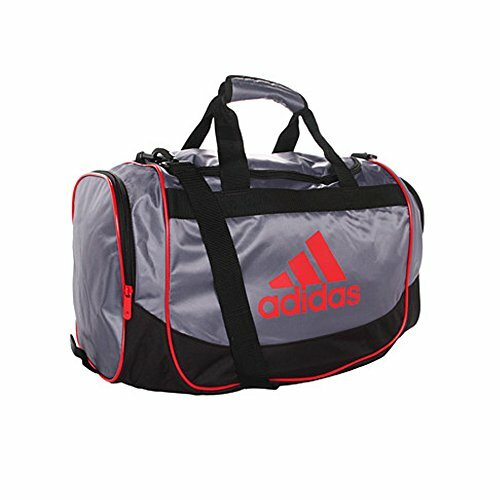 The Team Speed Duffel Large is built for superior team functionality. The large main compartment features an interior zippered pocket for your valuables. On one end cap of the duffel is a freshPAK ventilated compartment, great for keeping smelly shoes and gear separate from the rest of your stuff. On the other side of the bag is a zippered end cap pocket for additional storage. The large, easy-access front pocket with key fob is perfect for quickly stowing items. 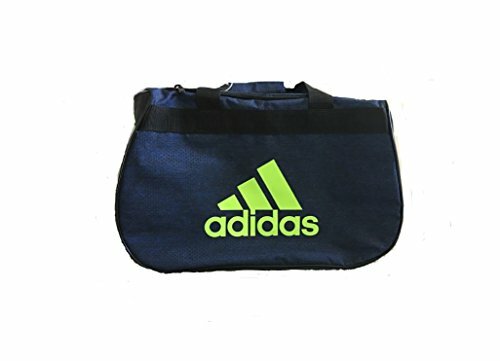 The ClimaProof water resistant bottom of the bag will protect your stuff from a wet field or gym floor. The dual adjustable, removable shoulder strap, padded air mesh shoulder pad, and wrapped haul handles let you carry your gear comfortably. The additional side haul handle allows for storage of the duffel in a locker and quick access to your bag in an overhead compartment. The screen-printed adidas brandmark and fast 3-Stripes complete the team look. The blank space on the opposite side of the bag and on the end caps leave plenty of space for team branding. 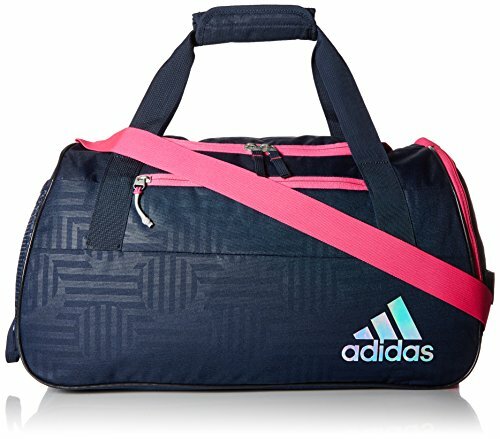 Built for the girl who has her eye on Captain - this bag will hold everything you need for practice or the gym and look great doing it. The main compartment is extra roomy and has zippered pockets to keep things organized. The shoulder strap is adjustable so you can wear it the way you like it. Lifetime warranty - built to last. Roomy main compartment - with lots of zippered pockets for organization. Adjustable shoulder strap - so you can wear it at the length that works for you. Zippered exterior small slip pocket for the small stuff. Exterior zipped compartment is ventilated to keep your shoes and dirty gear separate. Mesh expandable pocket on one end to store your water bottle. Imported. . . The Diablo small duffel has a top-loading main compartment. The shoulder strap is adjustable and the webbing carry handles have a padded wrap. The adidas brandmark is screen-printed on the side and end panels. Lifetime warranty - built to last. Large main compartment and two zippered endcap pockets for easy separation. Durable 750D body fabric. Adjustable shoulder strap for comfort. 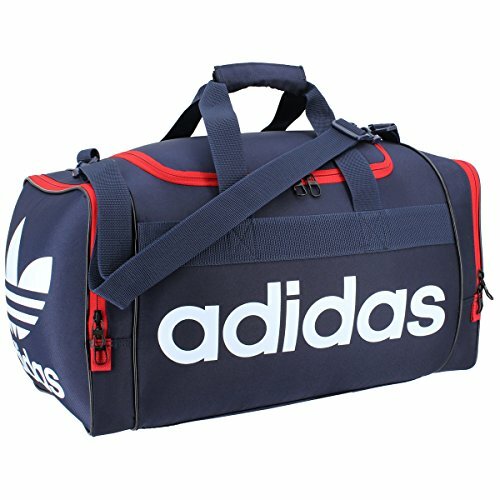 Looking for more Adidas Collegiate Duffel similar ideas? Try to explore these searches: Marking Crayons, Mitsubishi Photo Printers, and Crystal Cross Buckle Belt. 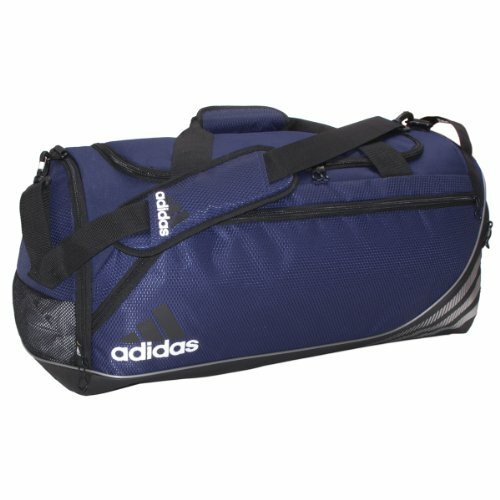 Look at latest related video about Adidas Collegiate Duffel. Shopwizion.com is the smartest way for online shopping: compare prices of leading online shops for best deals around the web. 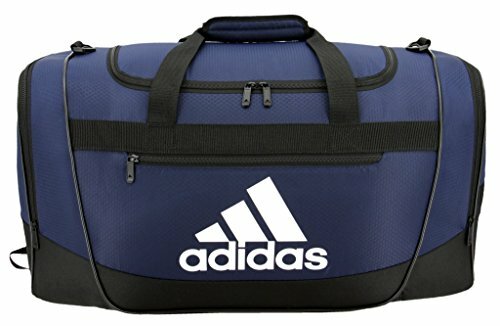 Don't miss TOP Adidas Collegiate Duffel deals, updated daily.